This suite has been freshly painted! Stay tuned for new photography! 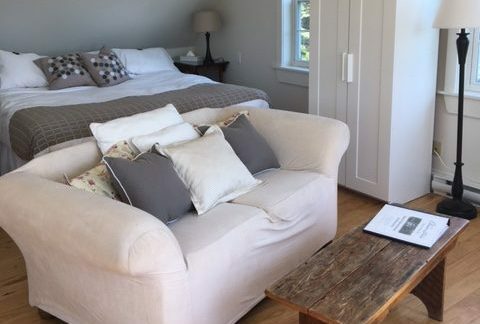 With a second floor balcony that overlooks the other cottages and the open Atlantic, Ocean Vista is rapidly becoming a favorite of couples that want to get away from it all; this upper level suite has been renovated with a kitchen and a king sized bed. Sunsets are marvelous to behold from the balcony, and in summer, fresh breezes off the Atlantic bring a hint of the sweet scent of flowers from the gardens below. PLEASE NOTE: Ocean Vista has recently been remodeled to include a handy kitchenette for the comfort and use of guests. The hot tub featured in the images below has been removed. New photography is coming soon!